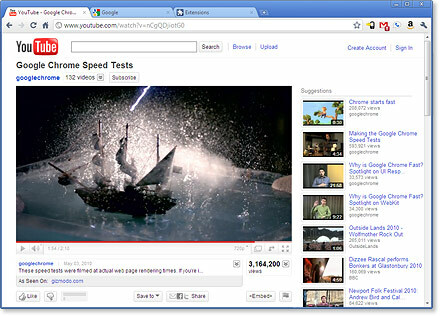 Google Chrome 20 runs web pages and applications with lightning speed. According to Google's statement, Google Chrome 18 is already in development, and has 1236 Bug issues currently, according to Google's tradition, will be repair 80% of the loopholes after the browser released, so 956 bugs need to be resoled before Chrome 9 released. As for the new features of Google Chrome 20, and there is not much suspense. I believe that in this version will be enabled by default GPU hardware acceleration. View of the Chrome OS scheduled release on Nov 11. Chrome 8 introduced a number of cloud computing capabilities, including cloud print and the background cloud and other Web applications. In fact, the next version of Chrome will add new features is very easy to predict. And it is reported that, Google Chrome plug-in center update some related new plug-ins every day. A free screensaver showing several great looking google logo design. Get info about Google PR datacentres for your web site. Qweas is providing links to Google Chrome 20.0.1132.57 as a courtesy, and makes no representations regarding Google Chrome or any other applications or any information related thereto. Any questions, complaints or claims regarding this application Google Chrome 20.0.1132.57 must be directed to the appropriate software vendor. You may click the publisher link of Google Chrome on the top of this page to get more details about the vendor.